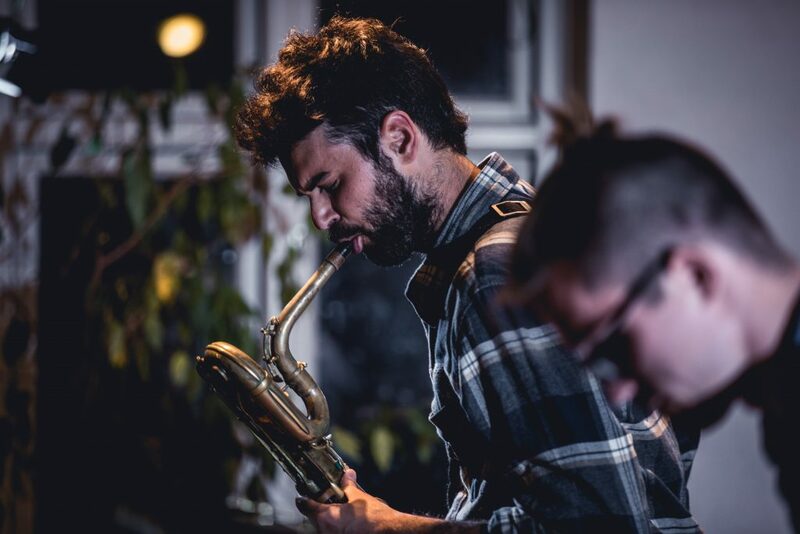 Giuseppe Doronzo and Morten Poulsen forms a duo that constructs organized improvisations, where focus lies not so much on rhythmic momentum as on the exploration of sonically complex environments, utilizing extended techniques on baritone saxophone and a custom-build electro-acoustic suitcase. The electro-acoustic suitcase is inspired by the Greek philosopher, mathematician, and scientist Pythagoras’ unusual approach to teaching. Concerned that his physical presence and gestures would distract his students from the message of his lessons, Pythagoras taught from behind a curtain. While this approach no doubt challenged the efficacy of students raising their hands when they had questions, it did create the concept of the acousmatic voice, a voice that one hears without seeing its cause or source. Similarly, the electro-acoustic suitcase hides the tiny sounds made in the suitcase, making a focus on listening a higher priority.